Our website address is: https://fineshootingaccessories.com. We do not share your data with any third party, data is specifically for the use of Fine Shooting Accessories to provide a service. 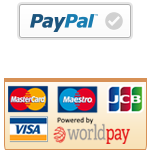 All payments made to Fine Shooting Accessories through our website are via Paypal. You are redirected to their site for processing. Our website is a secure site using SSL, your data is secure everytime you contact us or place an order.